Thai Sweet Potatoes Baked and Drizzled with Peanut Sauce - 5/5 Stars! If you love sweet potatoes baked to perfection and smothered in a sinfully sweet Thai peanut sauce than you are in LUCK, my friend. Most nights I just don’t have an excess amount of time to cook. So I’m always searching for quick and beginner-friendly vegan recipes for dinner. When I stumbled upon this combination of flavors I knew I found a winner – the flavors are complex yet delicate. Sweet yet sinfully spicy. Mouth-watering, if I must say, now that I’m writing about it! In my opinion, this is a perfect balance of spiciness and sweetness. The textures? Forget about it. I can’t say enough good things about these sweet potatoes! They are so filling too! I love how delicious and healthy they are – one bite and I immediately penciled them into my monthly rotating dinner menu! They are also AWESOME for lunch. SO quick! 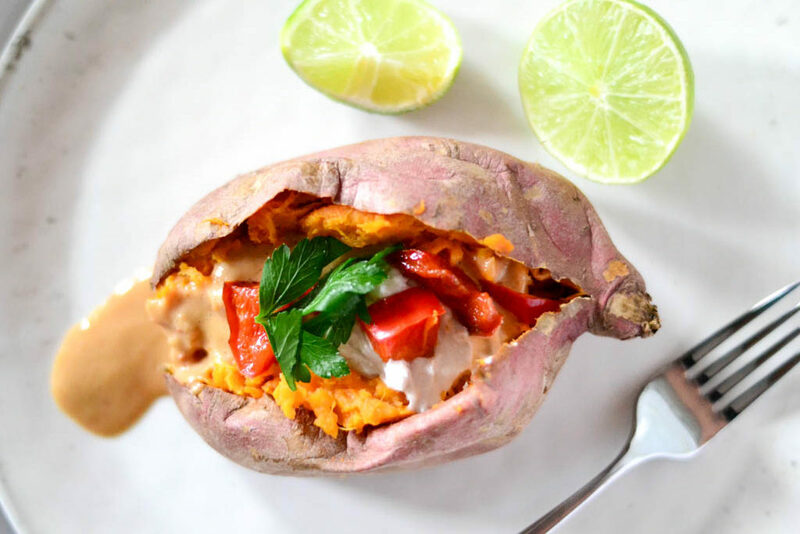 If you’re in a hurry try these sweet potatoes baked and ready to eat in 15 minutes or less! These spicy Thai inspired sweet potatoes are surprisingly sweet and totally delicious! Wash the sweet potatoes and pierce with a fork a few times. Wrap with a paper towel and microwave for approximately 10 minutes or until they are cooked. While the potatoes are cooking, blend the milk, peanut butter, soy sauce, garlic sauce, sesame oil, honey, crushed red pepper, garlic and sea salt in a food processor until creamy. Set aside. Heat a skillet over medium heat and add the olive oil. Add the pepper and sauté for 5 minutes. Slowly add the chopped green onions and then add the sauce. Stir until it's creamy and remove from heat. Slice the sweet potatoes down the center and slowly drizzle the sauce over each potato. Top with coconut whipped cream and fresh cilantro and enjoy!